Disclaimer: I was not compensated for or asked to write this review. All thoughts and opinions are my own. The Bia watches have started to ship, and I was lucky to get mine in the first batch of 500. I backed super early in the campaign on June 11, 2012; that date might be helpful to people who wonder where they are on the shipment list. It's been a long wait, although I expected this when backing a Kickstarter (crowd-sourced start up funding) product. I have friends who have worked at hardware start ups and seen significant delays in shipping dates - delays even twice as long as what we saw with Bia. It's par for the course with backing a not-yet-existing product and I'm thrilled to see them shipping. A big congrats to Cheryl and the team! As a runner, I'll be reviewing only the run functionality here. The watch can also be used for swimming and biking and is most closely compared to a tri watch like the Garmin 310XT. DC Rainmaker wrote a great, super detailed review of Bia that's worth reading too. 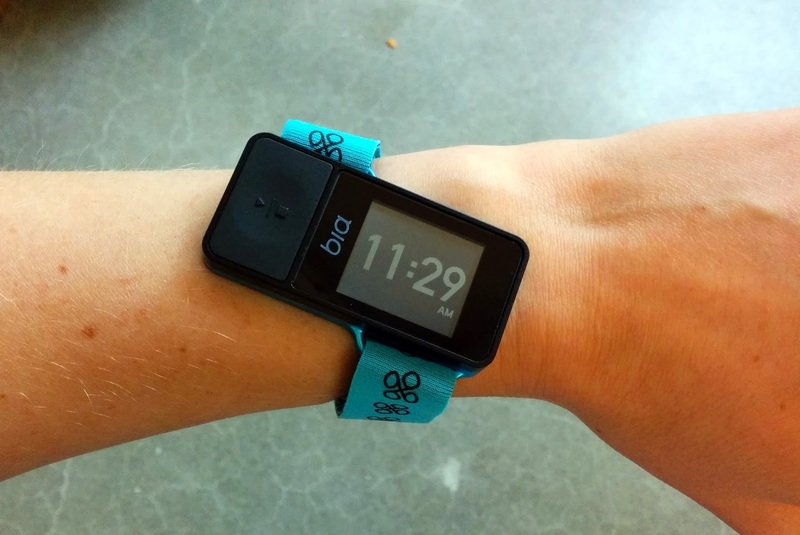 Bia is a two-piece GPS unit: a watch that runs on a normal watch type battery, and the rechargeable Go Stick that houses the brains of the GPS. Having the second piece house the GPS allows the watch to be smaller like a non-GPS sport watch. The watch itself is rectangular and slanted; the angle lets it miss the wrist bone and also makes it a bit easier to read when running. I wear my watch on the left hand and it is ideal for me, but I'm not sure how it would fit if you wanted to wear the watch on your right hand. I chose the turquoise watch color and absolutely love it. It's black on the front, turquoise on the sides and back, and has a turquoise band. Bands are interchangeable, so in the future I can add some more fun color to it. I find the fit of the watch face and band to be very comfortable, and I like how I can micro adjust the velcro to my wrist size. The neoprene material of the band feels good against the skin and doesn't stick like rubber can. Watch, Go Stick, and carry bag. How Bia fits the wrist. Side view of Go Stick, back view of watch. The Go Stick piece is lightweight and has a clip to attach it to your outfit (I like wearing it on the band of my shorts near the left hip.) You can also put it in your pocket such as on a bike jersey or running shorts. The Go Stick was my main point of concern with this unit - I wasn't sure how I'd feel about wearing a second piece. Would it bounce? Would it be heavy? Would it drive me crazy? I'm happy to report the answer to all of those questions is no. I don't even remember it's there after I clip it on. I'm surprised, but very happy, that this is the case. Go Stick, showing size as compared to a credit card. Go Stick clipped to my shorts. To start a workout, you hit the one large button and select the workout type on the touch screen: Run, Bike, Swim. Triathlon, Duathlon, and Stopwatch are also selections on the second screen. I've only tried Run and Stopwatch so far. After choosing Run, you then have the option to set run/walk intervals or indoor. It's unlikely I would use Run/Walk or indoor, but I know those are important to some people and wanted to call out the option. Type of Run Selection Screen. You shake the Go Stick to wake it up, then touch the run type choice to trigger the watch to look for the Go Stick. Every time I've done this it has connected to GPS almost instantly - no more than a couple of seconds. I'm very impressed with this part and love not waiting on satellites. Press the big button to start your workout and be on your way. When moving, the watch shows time, distance, and current pace. I prefer average pace which it doesn't have yet, and I've read that average pace is something that will come with software updates. I like that they have shipped the hardware but can still make tons of improvements and tweaks based on user feedback via firmware updates. Another change that will come with a future update is 'slap to lap,' meaning you can just hit the watch face to record a lap time. I'm looking forward to that one for track workouts! Total time, distance, current pace (0.00/mile because I'm standing still.) Bottom left shows time of day. I've found the GPS to be accurate as well. My first Bia run was on the track and it was matching the expected lap distances. 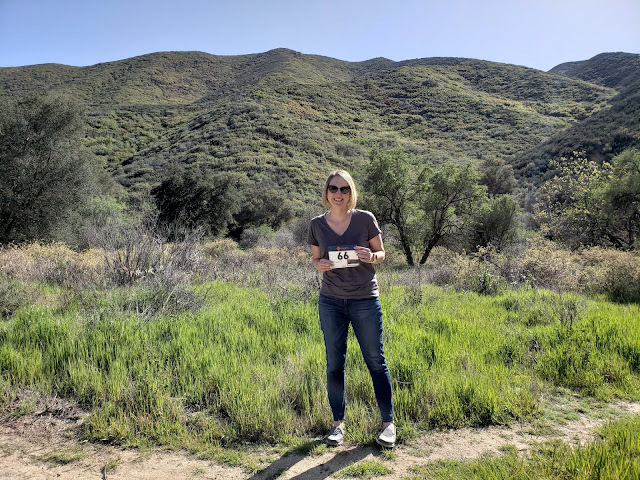 I noticed one little hiccup during my warm-up where my line veered off the track and then came back, but that even happens with my other GPS units at times and it didn't happen again. None of my other runs with Bia had any blips at all. 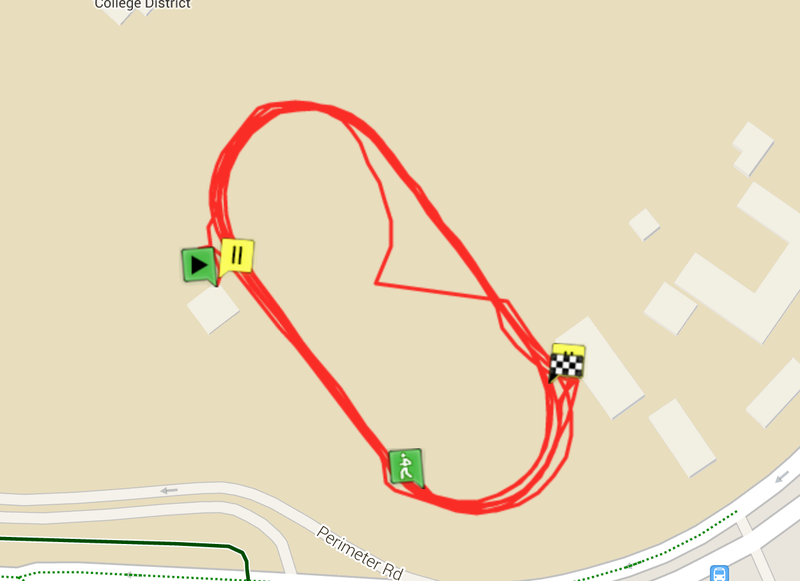 Track warm-up mapping from the my.bia-sport.com site. When your workout is complete, you hit the button to stop and the screen asks you if you are done. You have the option to save or delete the workout right then, which I love. Am I the only one that accidentally starts my watch sometimes...? Another really cool feature, which thank goodness I haven't used yet, is the SOS safety alert. Pressing the button for 3 seconds will send a text to someone of your choosing to let them know you need help AND tell them your location. It's a great peace of mind feature. The people to text are set up in your my.bia-sport.com settings page. Now for my very favorite part of the Bia system: syncing. Bia uploads your workout AUTOMATICALLY to their tracking site after you hit save on the watch face. If you use Strava, you can give Bia permission to auto-upload to Strava too. They'll be adding additional auto-upload integrations like Strava in the future, so stay tuned if you track via a different tool. A highlight for me was finishing my run with Bia, stretching in the gym, and having Kudos on Strava before I even got back to my laptop. If needed, you have the option to download the tcx file from my.bia-sport.com as well. I didn't have Strava set up for my first run, so I downloaded it and did the manual upload. Easy. To recap, for those of you who don't want so much detail. - The watch fits great and I like how I can micro adjust the soft neoprene band with velcro. - Auto upload to both the Bia tracking site and Strava is magical. No need to connect it to a computer for data upload, ever. - The touchscreen display is easy to use and has the right amount of sensitivity. - GPS connects faster than I ever thought possible for a watch. - SOS safety alert function sends a text to people you choose in the settings; it is activated by holding the button down for 3 seconds. - It's still an early version of a brand new product, so some of the software updates are still to come. I'm looking forward to 'slap to lap' and average pace. - Bia is a two-piece device, so you have to carry and wear two pieces. I don't mind it like I anticipated I would, but see the paragraphs above for more detail. The End. Have questions? Add them to the comments! So glad to read this review! I'm still anxious about using Bia, but your review gave me more confidence. I am wondering if I will be able to sync it with my Garmin data? I can't remember if this is a feature that exists or not. I plan on wearing it along with my Garmin when I get it, to compare accuracy between the two! I find myself choosing it over my Garmin, which is cool. I was thinking I should run with both but didn't remember to do it, I felt good about testing it on the track for run #1. I find different mapping units to be slightly off of one another, for example the TomTom GPS unit was always about 0.05 ahead of Garmin. No idea why! I think GarminConnect is one of the tools they want to connect auto-upload to, but I'm not 100% sure. I have been reading the Facebook page to see what's up! Hi - I ran with my bia AND Garmin for my first run to compare accuracy, and it's pretty much dead on. You can currently manually download your Bia runs as TCX files and then upload to Garmin Connect, if you are already tracking all your workouts on that site. I *did* notice that every tracking site interprets the TCX data slightly differently, so your mileage and time might have slight variations when you upload to Garmin and MapMyRun, for ex. 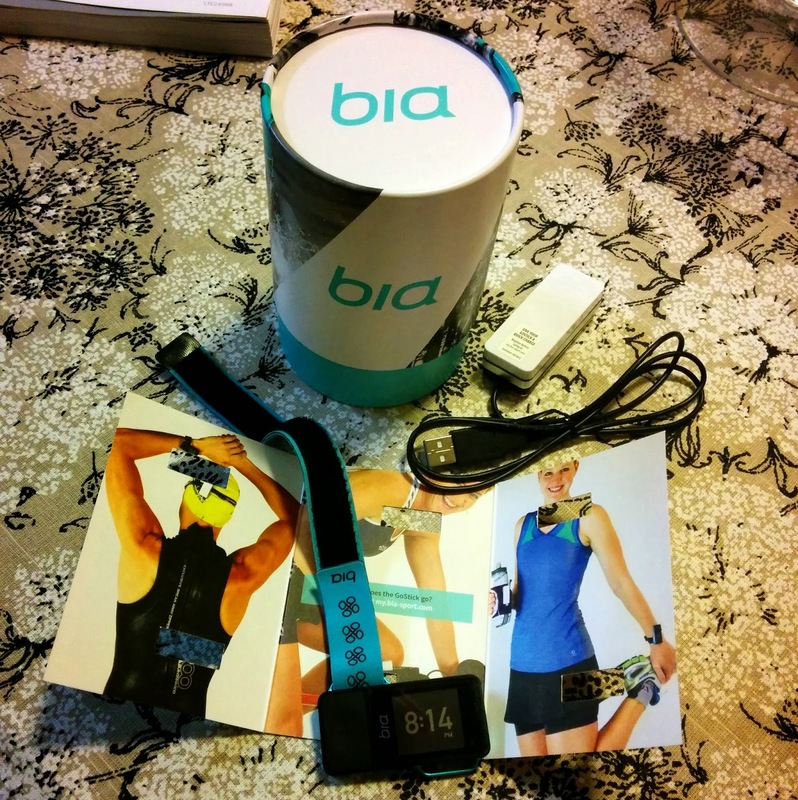 By the way -the BIA is sooo much more comfortable than my Garmin Forerunner 110. I've noticed that about different sites interpreting the TCX or FIT files differently too, it's interesting. Glad to know it's dead on! Gives me a little information of what to expect when (if) it finally arrives. I appreciate all the screenshots, and will be bookmarking this blog! Thanks!! Expect it to drop GPS frequently. I haven't had that issue either, no drops or even reconnecting messages for me. I have a BIA too. It is really nice. My only dislike is the band. While it is nice and comfortable the ends of the velcro sometimes get caught on my long sleeve tops or jackets. They've stated the bands are a work in progress, so I hope we get better ones at some point. But I LOVE the rest. Great product. Well worth the leap of faith and wait. Oooo interesting - I haven't run with it and long sleeves so I wouldn't have noticed that. I haven't had anything catch on clothing so far. I'm pretty sure they are going to do more with the bands though from what they said, so hopefully that will help. Glad you like yours too! Hah -- I have a COMPLETELY different experience with my Bia. On mine, you absolutely HAVE to clip the Go Stick to the FRONT of your outfit, you can not put it in a bike jersey pocket in the back or it won't connect. Secondly, mine drops GPS with no warning throughout my runs no matter where I'm running; oddly, it behaves EXACTLY like the test unit. The test bands were better, too -- shorter, and it didn't catch on my clothes. The other thing I dislike is the button action; you can't tell if you've pushed it or not, especially with gloves on. I'm truly thinking about Craigslisting the watch. Oh no! Mine hasn't dropped GPS ever and I haven't had any button problems. Have you contacted them to let them know the watch is having trouble? It doesn't sound like it's working correctly. I hope you are able to resolve it. Wow... you knew this was an initial release of a long delayed Kickstarter product... yet it seems like you are expecting it to be perfect. There are a lot of updates to come. How are you sooo surprised and critical of the initial released results? I have backed many Kickstarter initiatives... so many fail to ever pan out. Bia at least has seen the light of day. They have made it this far... do you really think they are going to drop the ball now and abandon the promises previously made of future features, goals and functionality? In the end, if you want it to be perfect, like ummm the Garmin 620/220 or maybe the Adidas SmartRun or lets see almost any recently released GPS Tracking device.. sell it on CL and buy one of those. But... do your homework on the manufactures forums and reviews. You will see these companies 100 times the size of Bia have just as many problems... and folks like Garmin have been making these devices for Years!!! This is Cheryl from Bia. I know the original test units we sent out last year had a number of "limitations" (to put in mildly). That's the reason field testing was done under NDA and why we were so appreciative of all the pain testers like you had to go through. These production units are markedly improved and you should NOT be having the issues you are describing. What is sounds like is that your watch and GoStick are disconnecting (not that your GPS isn't working - GPS keeps tracking even if watch/gostick disconnect). The "trick" is to wear both pieces on the same side of your body. I wear mine on the left-hand back hip of my shorts or in my same-side bike jersey pocket without trouble. If you try that and you are still running into trouble, please ping us at help@bia-sport.com so we can figure out what is going on and get things fixed. Anticipating the arrival of my Bia more than ever now. After reading your post it's going to so easy for me to just get to it! Thanks! Got my Bia in the first shipment and am LOVING IT!!! I wear touchtip gloves so the touchscreen is not a problem in my cold, cold weather runs. Wear the go stick in my arm sleeve pocket and don't even know that it's there. Personally I like the current pace vs the average pace. The only thing that I miss is the pace per mile breakdown online, well that and the calorie expenditure was nice also but that I can easily look up. I download mine to the garmin site since I have been using that with my garmin, a piece of cake to download the tcx file and upload it to garmin but I still don't get the mile by mile stats. It's a first generation product so a few hiccups are not unexpected, but must say that I am still finding it a quality product that I wear proudly - so proudly that my friends are probably getting tired of listening to me sing the praises of my Bia! Yay glad to hear you are enjoying it! I'm hoping they'll let us select ave or current pace for preferences, and I'm anticipating they will. Strava grabs my pace per mile breakdown when it uploads, but it sounds like the Garmin site isn't doing it yet? Thanks for the review! For someone who already has a GPS watch, what do you think makes the Bia stand out besides the emergency alert feature? I'll be interested to see how more software updates play out too. I hear they have some cool features coming and I want to use the auto lap for swimming when it comes. Not that I swim, but I intend to? - auto-upload/no need to charge/connect watch. The Garmin connect cables are a bane -- you end up spending 30 min jiggling the connection to get the watch to line up so the computer will 'see' it. This sounds awesome! I'll definitely keep it in mind the next time I'm in the market for a new watch. Thanks for the great review! Great review! I can hardly wait to get mine. I will be the swimming piece of the puzzle. You make a great point. Got some great information here. I think that if more people thought about it that way, they'd have a better time understanding the issue. Your view is definitely something Id like to see more of. Thanks for this blog. Its fantastic and so is what you've got to say. So I'm considering getting the men's version. Can I upload to Dailymile.com? Also, has anyone used it for swimming? Pool and open water? Thanks! I'm considering getting the men's version. Can I upload to Dailymile.com? Also, has anyone used it for pool and open water swims? can you track your distance in Kilometers instead of miles? Yep! You can set which units you'd like to use in the settings.